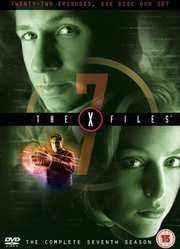 All 22 classic episodes from David Duchovny's last full season as Agent Fox Mulder. From Scully discovering the alien spacecraft in "The Sixth Extinction" and Mulder finally learning the truth about his sister in "Closure", to Mulder's own disappearance and Scully's miraculous pregnancy in "Requiem," these Season Seven episodes are a must for every X-Files fan! Episode titles: Hungry, The Goldberg Variation, The Sixth Extinction, The Sixth Extinction II: Amor Fati, Millennium, Rush, Orison, The Amazing Maleeni, Signs & Wonders, Sein Und Zeit, Closure, X-Cops, First Person Shooter, Theef, En Ami, Chimera, All Things, Hollywood AD, Brand X, Fight Club, Je Souhaite, Requiem.